This gluten-free, Paleo, and Whole30 brussels sprouts recipe(with AIP variation) is a lovely side dish for the colder months that takes only a few minutes to prepare. It's fancy enough to serve as a holiday side but still good for a regular weeknight dinner as well. If you've never had brussels sprouts cooked in bacon fat, now is the time to try! As we enter the colder months of the year, you most likely are craving comfort foods. 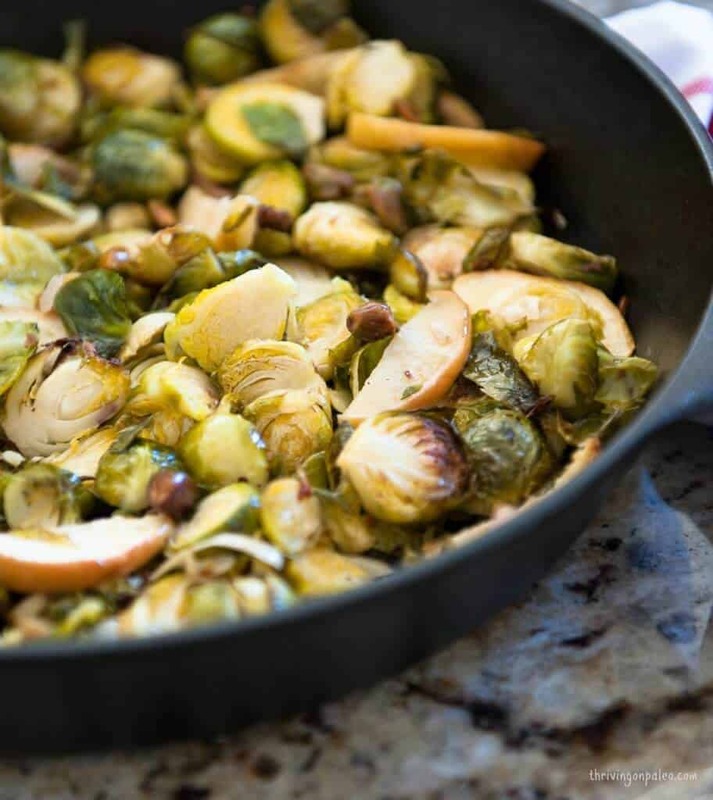 If you are looking for a hefty side dish to serve, look no further than this brussels sprouts recipe. Not only should veggies comprise a large majority of your plate, it makes you entire meal cheaper when you eat less meat and more veggies anyway. But when it gets cold, if you are anything like me, a salad or something light just doesn't cut it. You want bulk (but preferably without any added lbs added to your figure). And this side dish delivers. It is filling and delicious and can be served for a regular weeknight dinner or for a special holiday meal. You can even eat this as your breakfast (and it actually makes quite a tasty one – we just make extra and then I have the leftovers for breakfast). So if you want something comforting that won't ruin your plans to fit in that slinky dress for the holiday party this year, try this! And if you have not had brussels sprouts since you were a kid, I urge you to try them now. I used to HATE, let me repeat HATE brussels sprouts. Like HATE HATE HATE them. But then a few years ago I made them as part of a cooking class and realized that I now LOVED them. Like LOOOOOOOVED them. As in they are now my favorite vegetable kind of loved them. Not exactly sure what changed. My mom used to steam them, so there's that. But other than that, can't tell you. I've heard your palate changes too, but my kids absolutely love them too, so it isn't a kid vs. adult thing. But anyway, long story short, give them a try if you used to think these things were the ultimate in parental punishment. You might be pleasantly surprised like I was! Roasting in bacon fat is definitely the most delicious way to go, but if you don't happen to have it or want to make this a vegetarian/vegan meal, roasting in coconut oil or avocado oil is totally fine. This gluten-free, Paleo, and Whole30 brussels sprouts recipe (with AIP variation) is a lovely side dish for the colder months that takes only a few minutes to prepare. It's fancy enough to serve as a holiday side but still good for a regular weeknight dinner as well. If you've never had brussels sprouts cooked in bacon fat, now is the time to try! Cut off the ends of the brussels sprouts and pull off any yellow outer leaves. Roughly slice the brussels sprouts. In a large bowl, mix all of the ingredients well. Pour the mixture onto the prepared baking sheet and bake for 25-30 minutes. *Make AIP-friendly by omitting the pistachios and black pepper. just made these to go with my lunch…delicious! Apple and pistachio is a fun twist. I’m so glad you like them Theresa!